Remember you don’t have to buy a Microd to race with us! Is a popular and common phrase you hear when you are talking to a Club Members about joining our racing club. F.L.M.C. rents microds, so that families can try racing without the expense of having to buy a microd, motor, & a trailer to get started. The cost of doing this is very affordable, exactly $480.00 for the entire summer. (The season lasts from May to September) One of our Club’s Best Features is the opportunity to Try-Out. Where a parent can bring their child & let them try driving a Microd for 10 laps or so, at no charge. Another Plus is parents don’t have to have a great working knowledge of mechanics in order to compete. (older members share knowledge & expertise with new members) Here at Finger Lakes we have been able to keep our costs stable, which were the lowest of any microd club to start with. The Club has 5 Microds with Hand controls for Kids in Wheel-Chairs! In addition we have had & worked with Kids with Hearing Inpairment, Asma, ADHD, Autistic, Spina Bifida, Paralysis, Mentally Challenged, Rasmussen’s Encophalitis, & Bi Polar Disorder. 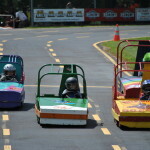 We Welcome anyone with a desire to try racing, that has a special needs. Please Give us a chance to help! ***Read more about our Club Goals and program for special needs kids on our web pages www.littlewheels.org . Videos are available on Youtube by going to the club’s web page, and clicking on the video’s link about half-way down the list of links on the left. When the page comes up, click on Flmc Youtube Channel in blue, this will take you over to the club’s Youtube channel where you can select from 8 different race offerings. Our Track named: Little Wheels Speedways is located just off the corners of Rts. of 38 & 34B, and is the sports of Microding’s Premiere Facility. Our Track is a picturesque setting with all of its beautiful shade trees, lush landscaped lawn, and well-kept buildings. A fine setting for you to spend time with your family & friends. 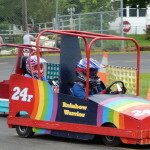 For costs and schedules see our website: www.littlewheels.org. 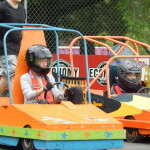 Racing is for both Boys & Girls ages 5-17. To schedule a try-out call (A.J. Burgess) at 607-898-3313. For me this is my 53rd season of being involved with the sport of microding, and 36th as the head instructor/flagger here at F.L.M.C.